Is there something more subversive going on here, or is the point of this to make us over-analyze a silly meme? Hmm. 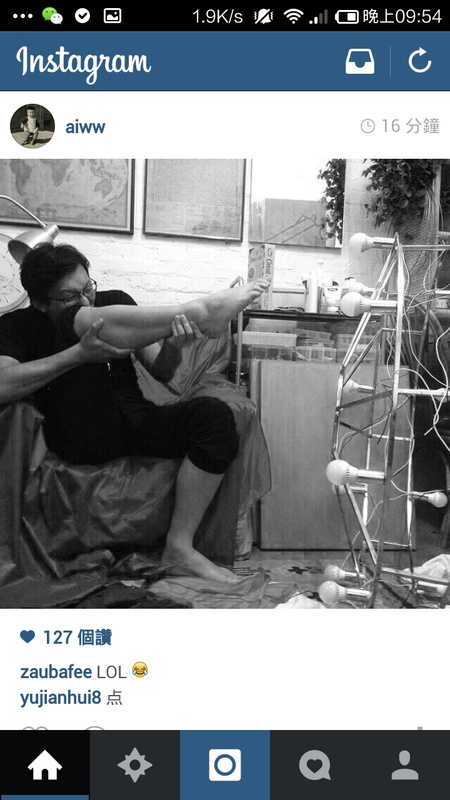 Weiwei’s so-called leg-gun series certainly raises more questions than it answers. Whether this is a political gesture, a genuinely subversive criticism of state-controlled media, an artistic expression or simply his answer to the famous “Angelina Jolie’s leg” meme remains a mystery. But the fact that one underwear-flashing, calf-clasping photo can produce a global conversation about state freedom, violence, Chinese communism, artistic interpretation and global power speaks volumes about the potency of the artist in our internet age. As one Chinese commenter said on The Red Detachment of Women image posted by Weiwei, “This firing made loopholes.” We’ll just have to wait and see where those loopholes lead.